Earlier this month we released the latest Smart Betting Club Magazine, Issue 90 and SBC Editor, Peter, spoke with Dean from RacingFM to detail exactly what was inside. If you missed this broadcast, you can listen again using the audio player below. Earlier this week we released a brand new, bumper issue of the SBC magazine, which contains an article that has taken the football betting world by storm. It reveals how in one easy step you can totally transform your football betting by identifying the best, most profitable football tips. Our analysis has revealed a method that in the example below made a near-5-fold increase in ROI from 3.1% to 15.3% by making some simple changes! Here at the Smart Betting Club we’re pretty sure that when it comes to our best performing football tipsters, they very much fall into the ‘Great Minds’ category, especially when you consider their long-term profitability. They clearly have the ability to successfully identify value in the betting markets. Certainly not the work of fools! Here’s another aphorism for you: “Two heads are better than one”. Let’s imagine for a moment, that you have access to a panel of the sharpest football betting brains in the business. (No not you, Robbie Savage). They each run their own proven prediction models to churn out what they consider to be the best value bets each week. Naturally there are times when two or more of these experts agree with each other on the best tips. Surely, if a number of our specialists arrive at the same conclusion in terms of where we should put our hard earned, then our confidence in that particular selection should go up? As Oscar Wilde might have said, for one person to identify value in a bet may be regarded as a rick, but for two or more to identify value, that may be regarded as being onto something! We examined what happened when tips selected by two or more from a panel of four of our very best football tipsters/systems happened to agree. As part of our research we chose four proven tipsters that each produce a decent number of bets each season across the English leagues and analysed data collected over three full seasons. One of the systems we used is available to SBC members completely free of charge – the renowned Fink Tank System. We then took 1 of the 3 other tipsters from our analysis (for now we will call them Service X) and ran some stats. We removed all bets where they had picked the same tip and isolated those bets where they had completely different tips from each other. But yet when we look at those tips where they both independently gave the same tip – this is where it really gets interesting as the table below reveals a 15.3% combined ROI. Our findings revealed that by isolating the best 304 bets, this was clearly where the majority of profit could be derived. 15.3% ROI vs. 3.13% tells its own story – almost a 5-fold increase. Focusing in on those duplicate bets would clearly improve your edge, and this was a pattern repeated across all our studies. Combining another tipster – Service Y with the Fink Tank revealed a similar pattern with the ROI going up from 4.05% if backing ‘individual bets’ to a whopping 19.6% ROI from combined bets. Any balanced portfolio of betting services needs diversification. We understand the need to spread our risk across different sports, different leagues, and different individual tipster methodologies, but we also know that there is often more than one way to skin a cat. What we have here between The Fink Tank and Service X is synergy, and that synergy can be harnessed to supercharge your profits. The Fink Tank has the lowest strike rate of winning bets, and the longest average odds, of all four services that make up our team of excellence. Service X, on the other hand, has a higher strike rate, and operates at a much shorter odds range. By combining the two, you can see that we’re getting the best of both worlds – the longer prices and a higher strike rate. The knock-on effect is massive. We achieve far greater consistency in our results, make our path to making profit much smoother, and make a lot more money! You can read about all of this and a lot more in our ‘Combo Tipster’ article, available now in the latest SBC magazine. We’ve revealed the identity of the Fink Tank System as one of our ‘Fabulous Four’ panel of tipsters and systems from our ‘Combo Tipster’ article and you can get this system FREE simply by becoming an SBC member. Not only will you gain access to the system plus a full user guide, but the Fink Tank System selections are posted each week on the SBC forum. So if you’d rather live an easy life, you can simply get all the picks at the click of a button! An SBC membership will also provide you with access to full details on who the remaining 3 expert football tipsters we’ve used in our analysis actually are (and our detailed SBC reviews on each of them). All 3 have a long term proven track record in producing superb football profits and as we’ve seen above – by combining the individual powers of this football betting brain’s trust, the heights we can hit when it comes to making profit are truly impressive. Not only that, but SBC membership will give you the chance to benefit from the discounts we can provide to our members when joining these 3 top-rated services. Combined, you would have been able to save £79.10 from the SBC savings on each of these 3 earlier in the season – just 89p short of the cost of a Gold SBC membership. You don’t need to be an expert tipster to pick out the value in that! 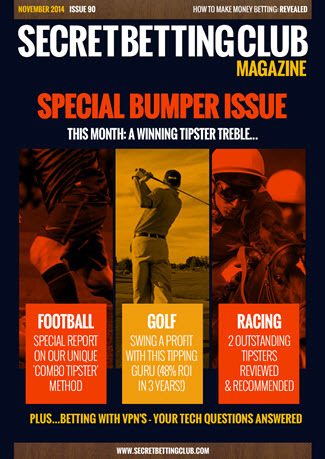 THIS MONTH: A WINNING TIPSTER TREBLE! FOOTBALL: A special report on our unique ‘Combo Tipster’ Method. Learn how to drastically increase your football betting profits with our help! Ideal for exchange betting – we expect this golf tipster to be much in demand. Top equine tipping duo with a 31% and 29% ROI respectively since 2013. Your tech questions on how to use VPN’s for betting answered. Not only this but as a Gold or Platinum SBC member you can also gain full access to our regular Betting Magazines, Practical Punter Reports & enjoy the peace of mind of our Money Back Guarantee if not satisfied once joining! Tonight sees the return of the Euro 2016 qualifiers and as ever, I have the qualifiers as generated by our Free International Football Betting System to share. Last time out in October, this system made a profit of 6.22 pts from 14 bets (1 pt flat stakes) with successful bets including Slovakia beating Spain and plucky little Liechtenstein’s draw with Montenegro. This followed on from the £465 profit from £25 stakes made during the 2014 World Cup. Here are a few of the qualifying ‘value bets’ as generated by our International Football System for this weekend. It is just a small sample but gives you an idea on how it all works. The best bets are those with over 10% value or more and are highlighted in yellow as in the graphic below. Those games where there is value in backing 2 outcomes (for example Georgia & Draw) may well be worth playing in the Asian Handicap markets. You can find more details on how to do this in the full system guide. This free system helps you evaluate each International football game to work out exactly where the value lies. Not all games will throw up a ‘value’ selection or if it does, often it will be below our cut-off of 10%. Take for example the game between Azerbaijan and Norway which our system reckons has the right odds on Azerbaijan (0% value) and is slightly wrong on Norway (-8.7%). The only value is in the draw but at just 6.3%, its not really worth backing. I also ran through each of the home nation qualifiers not include above and although neither of Scotland, Ireland, Wales or England offer any value over the 10% marker, I thought I would include them for interest below. Although the International Football System has performed very well ever since the World Cup, it doesn’t guarantee each bet will win, far from it. All it does is identify where it thinks there is value and if the bookmaker has the odds wrong. For example, as Ireland are currently a best-priced 3.5 (or 5/2) our system rates them as offering just 4.7% value. Should their odds go up to 3.75, their value then becomes 12.1% and they would qualify as bet using the 10% minimum criteria. The best way to follow this system is across all its qualifying games for a long-term period, so don’t expect too much or go overboard on just a few games this weekend. If you enjoy our International Football System you can take it a step further with our more Advanced Football System, which picks out value bets for English Football from the Premier League down to League 2. Within this you can find 4 different methods to follow the system in each week for both normal 1X2 betting (straight win bets on either the home or away team) or via the very popular Asian Handicap method. Whilst the 4 methods might not have the most catchy of names, since the 2008/09 season, each of them have made a fair profit across the top 4 English leagues (Premier, Championship, Leagues 1 & 2). You have to simply choose the one that suits you best. Win Only Vs Asian Handicaps – Which Is Best? Do you back a team to win or draw (1X2) OR do you back them in the Asian Handicap markets? It’s an age old dilemma, like whether you should back a horse to win or each way, so today I aim to tackle this with help from our own in-house Fink Tank football system. Long-term if following any of our 4 Fink Tank methods (as the results table below outlines) backing win only would have made either a 10.28% or 12.6% ROI, and backing Asian Handicaps either 6.78% and 8.07% ROI. Yet that doesn’t tell the full story or the various pros and cons of each method – so today I will aim to explain all and hopefully provide some food for thought on which approach makes the most profit! A profitable system finds value, which often resides in the odds offered for the outsider. This means you’re likely to be betting at bigger prices so when you win, you win big. Nothing gets the adrenalin rushing more than seeing a team you’ve backed at a big price land the odds. It’s great fun when things are going well. Over time, backing at bigger odds will lead to a higher return on investment and ultimately, more profit. Backing at higher prices means your strike rate of winning bets will be lower, leading in turn to longer losing runs. Will you cope psychologically when the bad times hit? You’re going to need a bigger bank to cover the bad streaks. Now let’s take a look at Asian Handicap betting, which is quickly become a very popular style of punting for many shrewd gamblers. Asian lines hold more liquidity, especially for those with access to the Asian bookmakers. It’s easier to get bets on at bigger stakes into the market. Betting on the Asian Handicaps should lead to a higher strike rate of winning bets. This means shorter losing runs so not such a test of temperament. Given a good system, using the handicap lines will lead to steady bank growth – the ROI may not be as high as 1X2 betting, but your bank will not need to be so big. Achievable Return On Capital figures will be much better, and ultimately this means making more money. You don’t get the adrenalin rush of the big wins – it’s slow and steady wins the race. So that’s the pros and cons of each method out the way, and now it’s time to dig into some real-life stats to get a consensus on the best way to run it. Based on the superb free football ratings from football boffins Dectech, our very own Fink Tank Football System (available to all Gold/Platinum SBC Subscribers) shows you how to convert their stats into some top value football tips each week. We have broken down our Fink Tank System into 4 different methods based around 1X2 and Asian Handicap Betting. The two we are going to look today are the ‘Win Value 20’ and ‘AH Value 20’ methods, which track the profits and loss backing the very same teams but in the 1X2 and Asian Handicap markets respectively. In the battle between the two methods of betting, it is clear that using the Asian Handicaps is coming out a clear winner so far this season. Better profit, better ROI. Win Value 20: 1,718 bets, 443 wins, Profit 225.5 points, ROI 13.1%, ROC 225.5%. AH Value 20: 1,718 bets, 934 wins, Profit 128.1 points, ROI 7.5%, ROC 427%. Dating back 6 seasons there are more points profit and a higher ROI for Win Value 20. Yet crucially, a far superior ROC is made by followers of the AH Value 20 system. ROC for the initiated is Return on Capital or Betting Bank Growth…Basically how much money you can expect to realistically make. Someone following the AH Value 20 system will be effectively making almost double the amount of profit than the follower of Win Value 20 due to the betting banks required. And it is that ultimately, which will sway us towards recommending Asian Handicaps as the best form of betting when comparing the two, especially in this example. Of course, that is not to say Asian Handicap betting will be most suitable everytime, but given the competitive odds and low bookmaker margins it regularly offers the punter a significant edge over simple 1X2 betting. What’s more, to make following the Fink Tank as simple as simple can be, all qualifying bets are posted in the Smart Betting Club’s member’s only forum each and every week. You can simply log-in to the forum as a member and find the best bets ahead of each set of games in the top 4 English Leagues. The Smart Betting Club is proud to announce the launch of our new USA Sport Focused Tipster Reports designed to help you make money betting Stateside. Whether you are a total novice or complete expert when it comes to betting on US Sports, these new reports will help you every step of the way. Our debut US Issue contains 3 profitable tipster reviews on NBA, NFL and MLB plus an easy to follow guide for newcomers on how to bet on NBA. Our in-depth reviews on just who the best tipsters are for popular US sports such as Basketball, Ice Hockey, American Football & Baseball. PLUS Most importantly – How to avoid being duped by US Sports tipping scams! Critically, our US Sports Tipster Reports are 100% independent, ensuring that at all times you can trust the information and reviews we reveal to you. This separates what we do from almost all other US based tipster review websites, who earn money from referring sales to the tipsters they feature. You can gain instant access to our US Sports Reports by subscribing to our new Platinum Package, which also features our entire collection of UK/EU based tipster reviews and reports, plus many other features of membership. In short – everything you need to help make money betting on sports whether it be Horse Racing or American Football!